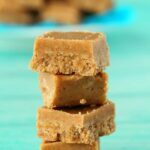 This vegan almond butter fudge is only 4 ingredients and only takes a couple of minutes to make. 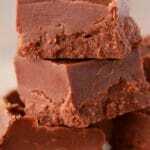 It’s also relatively healthy (as fudge goes anyway!). 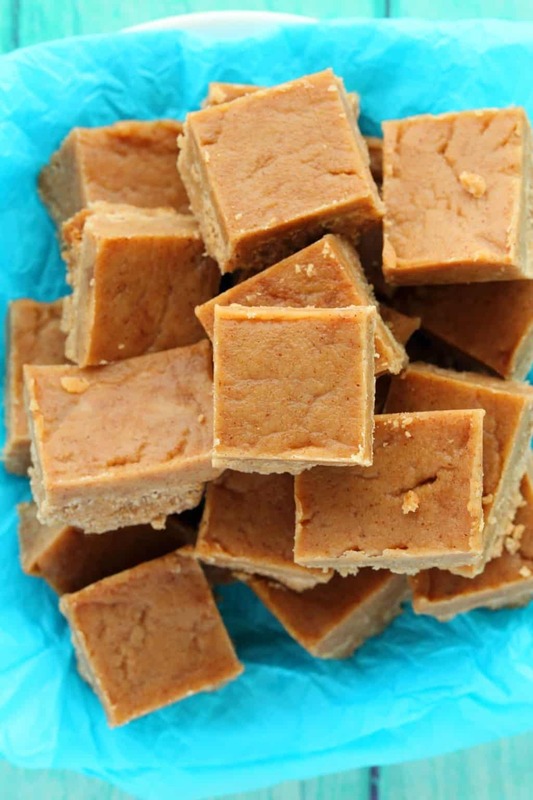 I’m a big fan of the decadent fudge varieties like the ones made with vegan condensed milk and heaps of sugar, but this is not one of those recipes. 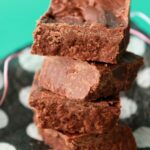 This is a super simple mix it up, smooth it down, freeze to set fudge recipe that’s actually quite wholesome too! 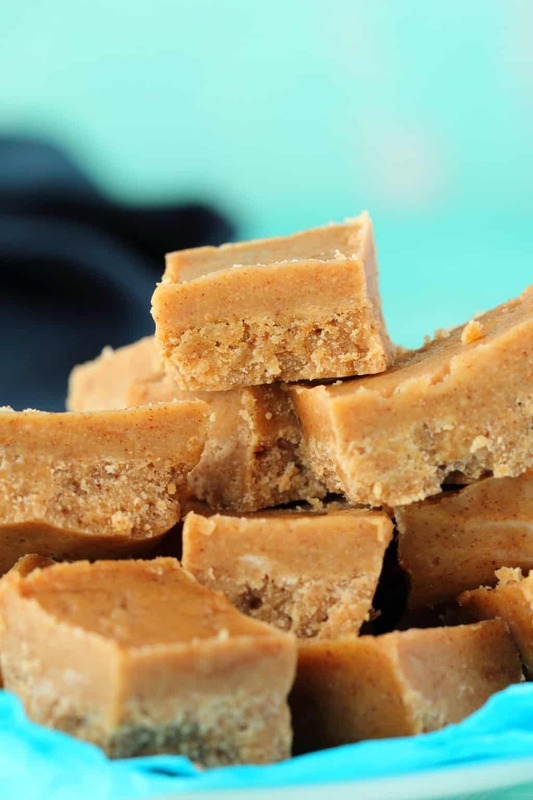 So if you have some almond butter, coconut butter, maple syrup and vanilla extract on hand, then you have all you need to make this fudge! If you don’t have coconut butter on hand, but do have some dessicated coconut and coconut oil on hand then you can make your own coconut butter! Though, admittedly, that is going to add some time to this recipe. 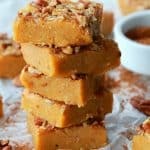 Heck you can even make your own almond butter if you want! But now I’m getting carried away, presuming you aren’t going to make everything from scratch, this recipe will be super quick and easy. Maple syrup can be replaced by a different syrup if you prefer, pretty much any syrup will do. I like the flavor of maple syrup here, and I’m always a fan of the caramel flavor of golden syrup, so those would be my two best options for this. And then it’s just a case of throw it all into a bowl, mix it all together and then smooth down into a parchment lined loaf pan and place into the freezer to set. You can either keep it stored in the freezer or the fridge. It doesn’t freeze solidly in the freezer so you can store it there and eat it straight out of the freezer. Otherwise the fridge is also fine for this (once it has set) and it will last a couple of weeks in the fridge. 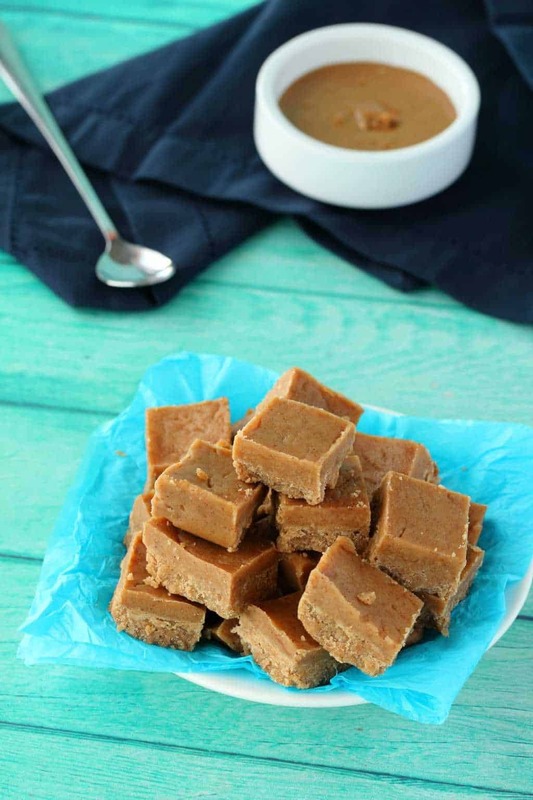 So let us know what you think of this vegan almond butter fudge in the comments and please do rate the recipe too. Thanks so much. Sign up to our email list to stay updated with all our latest recipes posted to the blog and you’ll receive an awesome vegan dinner recipes ebook totally free. 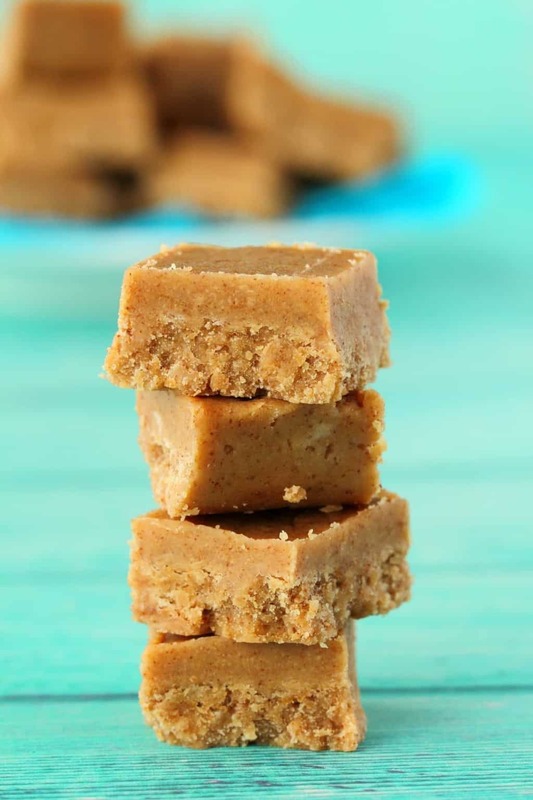 Super easy 4-ingredient almond butter fudge. 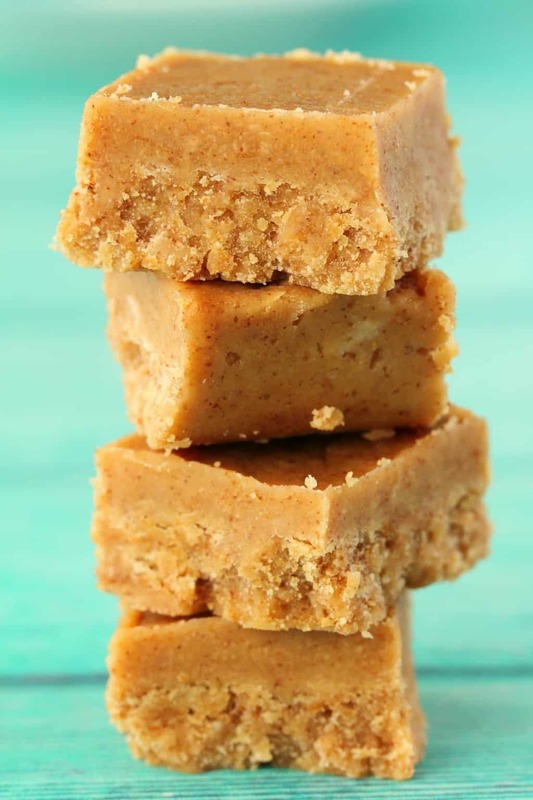 Deliciously rich, creamy and smooth and you can make it in minutes! Vegan and gluten-free. Add the almond butter, melted coconut butter, maple syrup and vanilla extract to a mixing bowl and mix in well. Transfer to a parchment lined loaf pan and smooth down with the back of a spoon. Keep stored in either the freezer or the fridge. *This is coconut butter and not coconut oil. Make sure that when you melt it you stir it very well as coconut butter tends to separate. An easy way to melt it is to stand the jar of coconut butter in a bowl of very hot water. *You could substitute any syrup for maple syrup or golden syrup, though those are my favorites in terms of flavor. *Recipe inspired by Chocolate Covered Katie. My concern with this recipe is the amount of saturated fat. What could be used besides coconut butter/oil? 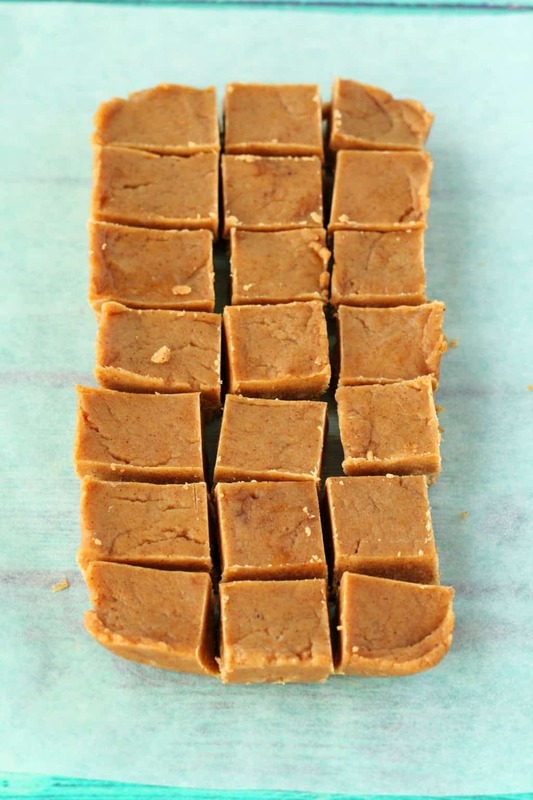 I don’t think there is a good substitute as coconut oil/coconut butter sets nice and hard so it’s what makes it into a fudge. 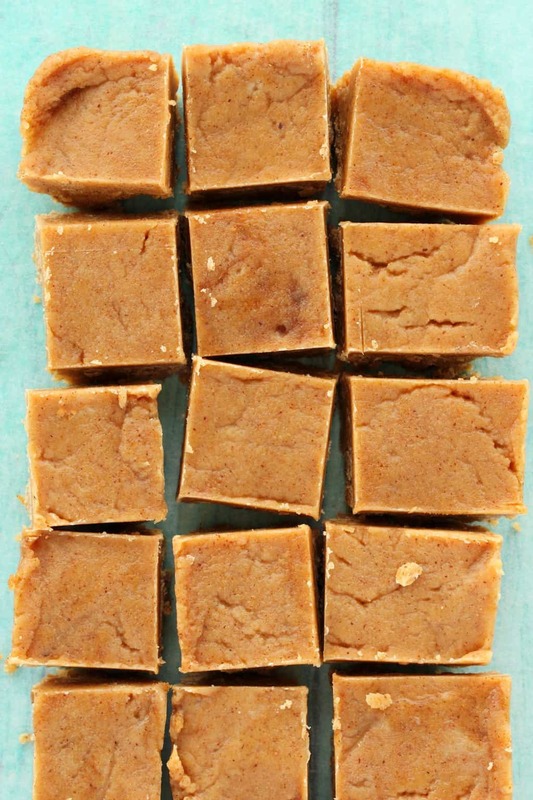 You could try something like our chocolate peanut butter fudge that doesn’t use coconut. How do you make coconut butter? 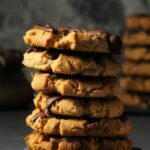 Do you use unsweetened almond butter? Not specifically. But I think it would also be fine if you do.